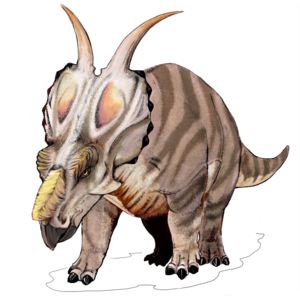 Achelousaurus was a kind of ceratopsid dinosaur related to the better known triceratops. It was identified and named in 1995. Click on the image for a full size version which you can freely re-use and modify. Print it and use it for your lessons, integrate it into your pages on Wikiversity, or use it in other learning resources and websites. Use the links below to find more images like this one. This page was last edited on 13 February 2018, at 02:45.